Sleep is a status ailment in the Mario role-playing games and in the Super Smash Bros. series. In Super Mario RPG: Legend of the Seven Stars, sleep is one of the more common status ailments that the player can have. A physical attack will wake a character from sleep, but a magical attack will not. While sleeping, a character is completely immobile and helpless. Additionally, Princess Toadstool is able to afflict this condition on enemies. When a character is asleep, he or she cannot move for a few turns. Unlike in Super Mario RPG: Legend of the Seven Stars, the character cannot be woken up until the effect wears off. Mario can inflict Sleep on enemies by using the Sleepy Sheep item, Mamar's Lullaby, or equipping the Sleepy Stomp badge. Much like with dizziness, certain enemies are affected greater than others. The Clubba, often found sleeping, will be affected for four turns of the battle (alongside White Clubbas, all plant-type enemies and Kent C. Koopa), where most other enemies will be down for three. Only Crazee Dayzees and Amazy Dayzees can inflict sleep on Mario; their song attacks can put him to sleep for three turns, but have a low chance of doing so (20% for Crazee Dayzees, 15% for Amazy Dayzees). Enemies hit with a successful sleep attack have a blue "splash" effect accompanied by low-pitched lullaby tones. In this game, when sleeping characters are attacked, there is a chance that they will wake. This is indicated by a small exclamation point over the character when they are attacked. The sleep icon is a Sleepy Sheep, and a number by the Sleepy Sheep indicates how long the character is asleep. In Super Paper Mario, if the character is attacked by a Cherbil, a Crazee Dayzee, or an Amazy Dayzee, he or she will fall asleep and must be awakened by shaking the Wii Remote until the on-screen meter is filled up, unless the player gets attacked by an enemy. Also, the player can make enemies sleep by using a Sleepy Sheep. In the Underchomp battle, the player can use Piccolo to temporarily make the Underchomp fall asleep (this is based on Cerberus' weakness of falling asleep when music is played in Greek mythology). Mario and co. will also sleep after a prolonged period of inactivity - Tippi will perch herself atop the head of the character currently onscreen, and any character traveling with the heroes (such as Squirps or Luvbi) fall asleep as well. Inflicted by a Baahammer, the Sleep status ailment acts like the Mushroom status ailment from Super Mario RPG: Legend of the Seven Stars: unable to attack, though slightly heals every turn. The sleep status also can be caused by using the Pillow, Bed, and Luxurious Bed Things. Mario can also become asleep from the Things with sleep properties unless the player mashes repeatedly. Kamek's purple spell can also put Mario to sleep too. Jigglypuff putting other fighters to sleep with her Sing move in Super Smash Bros. Brawl. 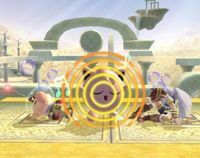 Characters can go to sleep (the status effect here known as Asleep) in the Super Smash Bros. games by Jigglypuff's Sing attack, Luigi (in Super Smash Bros. Brawl) and Peach's Final Smashes (Negative Zone and Peach Blossom, respectively), and Bellossom's Sweet Scent. This leaves them vulnerable for opponents to attack them. Players that move the control stick and mash buttons will wake faster. In Super Smash Bros., characters with lower damage percentages sleep for longer, while in Super Smash Bros. Melee onward characters at higher percents sleep longer. In addition, characters in the air cannot be put to sleep. Attacking a sleeping opponent automatically wakes them up. In Super Smash Bros., when characters are put to sleep, the animation is simply the character's dizzy animation with music notes appearing from that character (as Sing is the only way to put opponents to sleep). In Super Smash Bros. Melee onward, each character has a proper sleeping animation. This page was last edited on April 22, 2019, at 22:44.